Monday was my first real day living in my new home in Park Slope, Brooklyn, and I wanted to celebrate with a nice homely dinner. Having seen a recipe on the lovely blog A Cup Of Jo promising “the best roast chicken you’ll ever have” I figured it was worth a try, even if it was a bit hyperbolic. The photos alone had me dreaming of a slap-up but chic provençal dinner: the smell of herbs, linen napkins, a barely dressed green salad and a crisp white wine to complement some succulent chicken. In the event it was rather less frenchy-chic and I wasn’t even close to having those aromas wafting from the oven when the boy arrived home from work. But there’s a lot to be said for having someone playing ukulele while you’re getting dinner ready, and for aching-bright orange and pink Brooklyn sunsets, and you know what? It really was the best roast chicken I’ve ever made. Usually I would stuff a chook because stuffing is magical, obviously. But the simple herb, lemon and garlic filling smelled divine immediately, and the flavour really permeated the meat. The recipe called for culinary lavender as well, which I would have loved to use, but I didn’t find any. 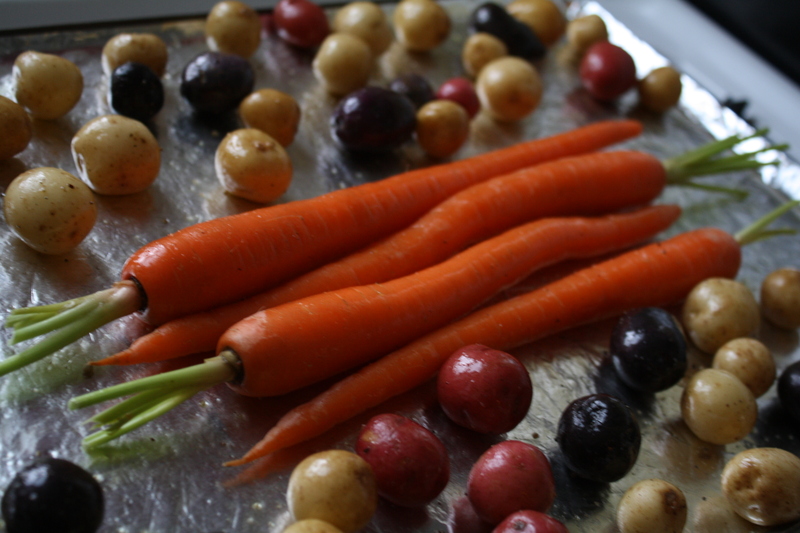 I did find some pretentious and adorable tiny rainbow potatoes at Whole Foods and they roasted perfectly, along with some carrots. Rinse the chicken and pat it completely dry with paper towel. Rub it down with the butter. The closer your butter to room temperature, the easier this will be. Seems obvious but that didn’t stop me from making a mess of my chook’s skin with too-hard butter! 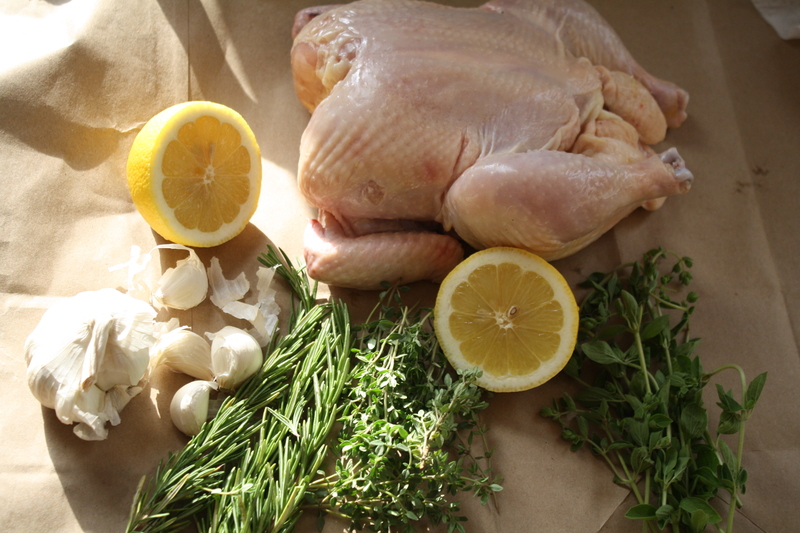 Cut the lemon in half, peel and crush the garlic cloves (just squish them with a big knife, get the aroma going), and place these along with 3 sprigs of rosemary and 5 sprigs of thyme into the cavity of the chicken. You’re then supposed to use kitchen string to truss the legs together so it’s all held tightly inside. I forgot to get string and thus we found ourselves trying to tie the legs together with fine string pilfered from an old kite, which ended up snapping in the heat of the oven anyway. But it all worked out fine. The lesson being, no need for stressing about trussing if you haven’t got the right gear. Sprinkle a tablespoon each of chopped rosemary, thyme, marjoram and lavender (if you have it) over the butter-massaged chicken skin. Season well with salt and pepper. 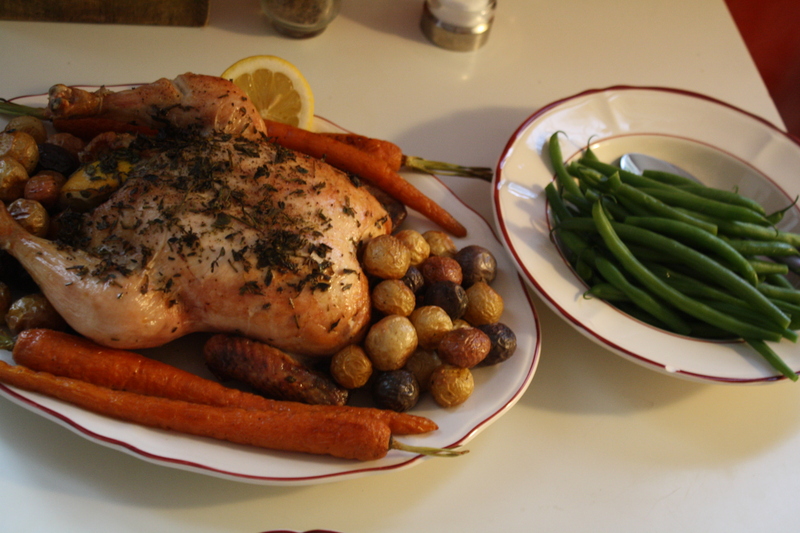 Let the chook sit and come to room temperature while you preheat the oven (and your roasting dish) to 450 F (230 C). When the oven reaches the right heat, put the chicken into the roasting dish breast side up and cook for 45 minutes to an hour. If you have a meat thermometer, the bird is cooked when it reads 165 F at the thickest part of the meat. We didn’t have one but managed to fluke a perfectly cooked chook with a shade under an hour in the oven – it was about 3.5lb (1.5kg). I put in the tiny potatoes and carrots (all just scrubbed, skins still on, doused in a little olive oil and salt) when the chicken had been cooking for a half hour, and turned them after 15 minutes. Insanely easy, insanely impressive. Give it a try some time.